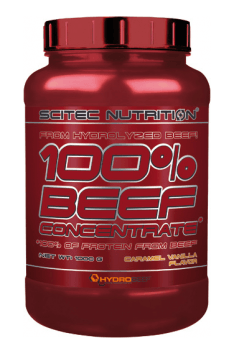 Scitec 100% Beef Concentrate is a 100% pure beef protein concentrate, which due to enzymatic hydrolysis is digested faster and easier. What distinguishes the product from other beef protein supplements is the fact that the meat used for production is 100% natural and free of hormones. Protein, as the basic building block for muscles, is one of the most frequently chosen supplements. The most popular protein on the market is milk whey, but there are also many other sources of protein, such as egg whites, soybeans, peas and oats. Each of them, however, has a slightly different aminogram, i.e. the content of individual amino acids, absorption time and bioavailability. Beef protein has a high BV=80 (biological value), which determines the degree to which the protein is bioavailable for a human body. It means that the protein used in the supplement absorbs very well and in comparison with vegetable proteins contains a higher concentration of essential amino acids (EAA), which should be provided to the body from food. The appropriate aminogram of the beef protein supports the building of muscle mass. Although it does not contain as much branched-chain amino acid (BCAA) as the whey protein, it has a high content of L-Glycine and L-Proline. Both amino acids are necessary for the production of collagen and regeneration of connective tissue found in joints, tendons, and ligaments. This means that beef protein can help to maintain healthy joints and tendons or help them regenerate after injuries. The product has undergone enzymatic hydrolysis, i.e. the process in which protein breaks down into single amino acids – also called the pre-digestion. As a result, the protein is absorbed much faster and easier from the gastrointestinal tract and may be immediately used for building purposes. Muscles consist of amino acids, most of which must be obtained from food. Insufficient supply of amino acids with diet leads the body to obtain them from its own tissues. It is called muscle catabolism or breakdown of muscle proteins into individual amino acids in order to meet the body's needs. The more proteins consumed, the easier it is to maintain the muscle mass already developed. The proper protein supply should be assured by people wanting to lose excess body fat, not only to maintain energy-rich muscle mass, which burns more calories than comparable fat mass. Protein is also a macronutrient with a high satiety index, which will help to control the appetite and, in turn, enhance fat loss. Amino acids are not only the basic building block of muscle tissue but also regulate the activity of the factors responsible for increasing the rate of synthesis of new muscle proteins (MPS). Increased protein supply is associated with an increased activity of anabolic hormones such as insulin or insulin-like growth factor-1 (IGF-1). In addition, amino acids reduce the activity of myostatin hormone, which is responsible for the inhibition of myogenesis, and thus the increase in muscle mass. The supply of protein will not only ensure muscle growth but as mentioned earlier, it may contribute to the improvement of the condition of soft tissues, which besides the muscle also get damaged during a workout. In conclusion, Scitec 100% Beef Concentrate is a high-quality, well-absorbed protein supplement containing 100% beef protein. The product provides a large amount of exogenous amino acids that promote building of muscle mass and renewal of connective tissue. Available in delicious flavors, ideally suited for consumption after trening or as an addition to dessert. Dissolve 30g (2/3 scoops) of the product in 250ml of water. Thoroughly mixed protein to be consumed immediately after training. Do not take or take one portion depending on the individual needs. This protein concentrate is ideally suited for people who do not tolerate milk proteins for various reasons, and who want to provide a high-quality and well-digestible source of protein. Do not worry about the content of saturated fat in the product because its amount, as well as the total fat content, are very low. Depending on the purpose and fitness level, it is recommended to take from 1.6 to 2.2 g of protein for one kilogram of body weight, including plant proteins. The concentrate perfectly complements a diet with necessary proteins. Raspberry cream: Hydrolyzed Beef Peptide Protein, Maltodextrin, Acidity Regulator (Citric Acid Anhydrous), Flavors (Strawberry, Wild Berry), Emulsifier (Soy Lecithin Powder), Dextrose, Sucrose, Thickener (Xanthan Gum), Color (Beetroot Red), Sodium Chloride, Sweeteners (Acesulfame K, Sucralose).